Music has always been a teacher of theology and so it still is. It is just that the theology changed to suit the music or else the music was changed to reflect the new theology. We may sometimes call it contemporary but is far from contemporary. It is just rehashed out of the world into a veneer of gospel. I can fondly remember the experiences on the youth services of my day. I loved walking into a meeting being conducted by youth and hearing gospel songs being sung and a young person preaching as well as many adults I ever heard. I loved standing around a bon fire on the beach at night while we shared memory verses and testimonies of the saving grace of Christ and the struggles we were having at school because of our testimonies. I recall youth camps that were reflections of the old-fashioned camp meetings the adults were running. In fact, there were no serious differences between youth and adult services except perhaps ours were more youthfully vibrant. The content was just as deep biblically. This is the most important question in the life of any human being. 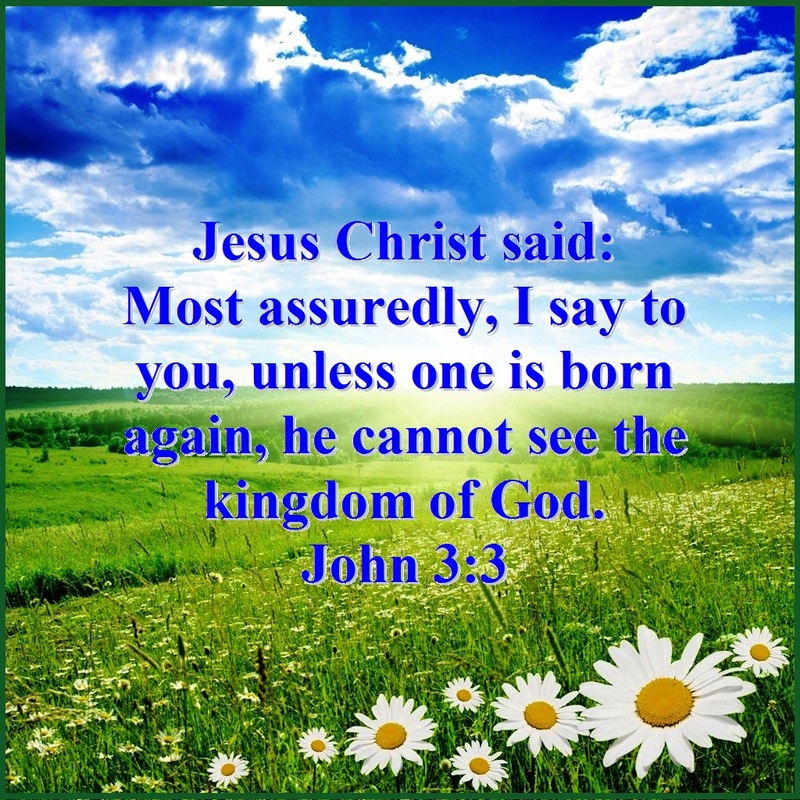 Jesus Christ said: “Most assuredly, I say to you, unless one is born again, he cannot see the kingdom of God.” (John 3:3). According to Paul, a sinful lifestyle reflects a heart that is not right with God and by their behavior they are revealing that they do not belong to His kingdom, regardless of what they affirm. Some people think they are Christians because they prayed a sinner’s prayer, yet their lives bear no evidence that they know Christ. Paul said that the proof of salvation is a changed life. If the only proof a person can offer is something they said or did a long time ago, that is very weak evidence. The proof of a Christian life should be seen in a person’s continual reflecting Christ through their lifestyle each day. If anyone wishes to know how to recognize a person who has truly been “born again,” here are some of the evidences as described in the Bible. When the born again believer sins and becomes aware of the offence, they immediately ask the Father for forgiveness because they recognize the sacrifice Christ paid for us on Calvary and they want a renewed unbroken fellowship with Him. The person believes in Christ – “Whoever believes that Jesus is the Christ is born of God” (1 John 5:1). A person, who has been born again, believes that Jesus Christ is our Savior, that He is the Son of God and the only one that can forgive our sins. That He came to this earth to reunite us to the Father. The person is righteous – “If you know that He is righteous, you know that everyone who practices righteousness is born of Him.” (1 John 2:29). A person, who has been born again, lives a holy life and seeks to live according to God’s will. They do the things that please God and avoid those things that God detests. They desire to look continuously at Christ as The example and to follow their Savior by keeping His instructions and commandments. A person who has been born again has a special love as all real Disciples of Christ have. They love all but have a special love for those who share their faith in Christ. Just as Jesus does, we are to love the worst sinners and care for them and bring them to the saving knowledge that comes from knowing our Lord Jesus Christ. Those who are truly born again will not be defeated by the world. Not only do they make every effort to avoid sinning, but also stay away from anything that could lead them to sin. They are careful with whom they associate and protect themselves against the enemy with the armor of God (Ephesians 6:10-20), are watchful, humble and diligent in their prayers. A person’s actions need to be examined to see if they are consistent with their profession of faith. 1 John 2:4 says, “If you say you know Him and do not keep his Commandments, the truth is not in you and you are a liar.” So, if someone professes to be a Christian and yet behaves in a manner contrary to what they professed we would naturally doubt their salvation. The term “born again” is being used very loosely these days, and we need to realize that true regeneration is a permanent, life-transforming miracle accomplished by God Himself in a believer’s life. Finally, we must be very careful not to be too judgmental, too quickly. It is a serious thing to say that someone is or is not saved. If we are unsure about the salvation of someone, then we should pray for that person, ask God to work in their life, and ask the Lord to give us wisdom. If you examine your life and see consistent disobedience to God, something is wrong. Make sure you are under no delusions, and that you are not depending on any false assurance of your salvation. Settle things with God today before it is too late.